So You Want to Fix the Trade Deficit? Well, I don’t think a few tariffs and quotas, plus “tweaking” Nafta, are going to do it. And blowing a hole in the Federal deficit ain’t likely to help. 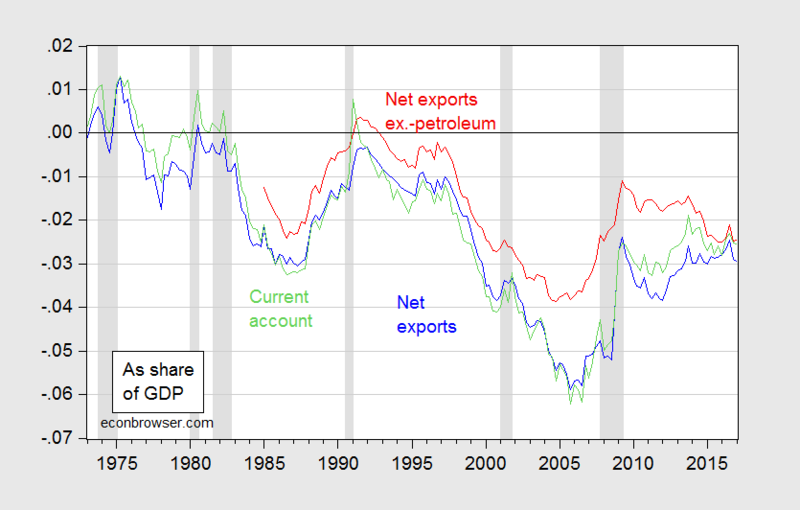 Figure 1: Net exports (blue), net exports ex.-petroleum products (red), and current account (light green), as a share of nominal GDP. NBER defined recession dates shaded gray. Source: BEA, 2017Q1 3rd release and author’s calculations. 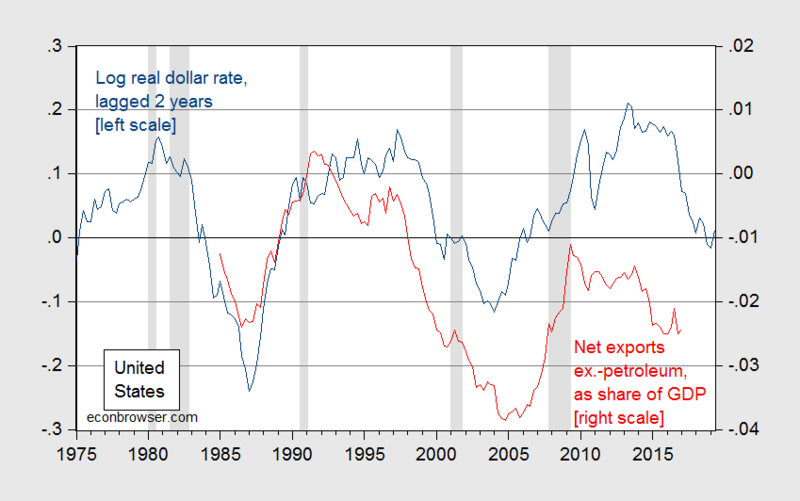 Notice that net exports have improved since the onset of the Great Recession, in part because of slower growth, a depreciated dollar, and an increases in petroleum product exports (as highlighted by the fact that the ex-petroleum net export series moving closer to balance than the overall). The dollar’s value is one key factor in these movements. Below in Figure 2, the dollar exchange rate against a broad basket of currencies (defined such that a downward movement is a appreciation) is graphed, lagged two years, against net exports, ex-petroleum (under the presumption that exchange rates do not exert direct effects on oil prices which are denominated in USD). Figure 2: Log US dollar exchange rate against a broad basket of currencies, lagged two years (dark blue), net exports ex.-petroleum products as a share of nominal GDP (red). Exchange rate defined as downward movement is a dollar appreciation. NBER defined recession dates shaded gray. Source: BEA, 2017Q1 3rd release and author’s calculations. So, the question is whether trade measures will have a noticeable impact on the trade balance (this is a separate question from whether it’s welfare improving to impose such barriers). The answer depends in large part whether you think the impacts of US income and the dollar’s value (the two key variables) are going swamp any changes in relative prices coming from tariffs and quotas imposed at the sectoral level. I tend to think that level of US national saving (the sum of government budget surplus and private saving) and desired investment tend to drive the trade balance (approximately the current account, as shown in Figure 1) more than the trade balance drives the US budget balance, private saving and investment. In that framework, trade protection measures have second order effects, unless they were to drastically change these macro aggregates. Tariff revenues are too small to affect the budget balance. It is hard to see how they increase private savings; maybe they could affect investment in protected sectors — but that works in the wrong direction. (More on the national saving identity here). So, the Trump project of reducing trade deficits through protection, while maintaining growth (protection which triggers retaliation and a global slowdown could “work” to reduce the US trade deficit) is doomed to fail. Something to remember, as the House starts trundling toward massive budget busting tax cuts (well, unless you believe spending cuts will be imposed in line with the tax cuts; if you do, well David Stockman has a bridge to sell you). Addendum: For an econometric analysis of trade elasticities, see this paper. My estimates for the elasticity of non-agricultural goods exports are around unity, those for non-petroleum goods imports around -0.5 (for data through 2010). In recent (non-published) work, Hiro Ito and I find that (updating Chinn-Eichengreen-Ito) the current account responds by about 0.6 percentage points of GDP for each percentage point change in the budget balance. This entry was posted on July 20, 2017 by Menzie Chinn. I’m not an intellectual historian, but until the national income tax (the WWI era) tariff revenue was central to total Federal tax receipts. Do we still hear reverberations of that era? Certainly another historical anachronism is at play: tradable goods – agriculture, manufacturing – used to be important but are today a small share of our economy. It’s not that “hard” goods don’t matter, it’s that they’re not central to what happens to the overall economy. Healthcare is. I’m not in my office so I can’t check whether the US ran trade deficits in the 19th century; my memory that our railroads were financed by British investment suggests we did. Low income countries today often have very high tariffs, that doesn’t keep them from running trade deficits. You likely have many good arguing points; blog posts mandate brevity. But I look forward to followups. WWKD? What would Keynes do? “Contemporary experience of trade restrictions in post-war Europe offers manifold examples of ill-conceived impediments on freedom which, designed to improve the favourable balance, had in fact a contrary tendency. “For this and other reasons the reader must not reach a premature conclusion as to the practical policy to which our argument leads up. There are strong presumptions of a general character against trade restrictions unless they can be justified on special grounds. The advantages of the international division of labour are real and substantial, even though the classical school greatly overstressed them. “The fact that the advantage which our own country gains from a favourable balance is liable to involve an equal disadvantage to some other country (a point to which the mercantilists were fully alive) means not only that great moderation is necessary, . . . but also that an immoderate policy may lead to a senseless international competition for a favourable balance which injures all alike. “And finally, a policy of trade restrictions is a treacherous instrument even for the attainment of its ostensible object, since private interest, administrative incompetence and the intrinsic difficulty of the task may divert it into producing results directly opposite to those intended.” The General Theory, pp. 338-339. Trade wars are a losing proposition, but since Trump knows nothing about everything, we are likely heading down that road to perdition. WWKD is a very nice reminder of Joan Robinson’s beggar thy neighbor discussion. Incidentally that was during a period of fixed exchange rates when one could pretend trade protection would raise net exports if one pretended the rest of the world did nothing as we opened a trade war. Menzie is pointing that during a period of floating exchange rates that the case for trade protection as an aggregate demand tool gets even more untenable. “Never in history was there a method devised of such efficacy for setting each country’s advantage at variance with its neighbours’ as the international gold (or, formerly, silver) standard. For it made domestic prosperity directly dependent on a competitive pursuit of markets and a competitive appetite for the precious metals. “When by happy accident the new supplies of gold and silver were comparatively abundant, the struggle might be somewhat abated. But with the growth of wealth and the diminishing marginal propensity to consume, it has tended to become increasingly internecine. The part played by orthodox economists, whose common sense has been insufficient to check their faulty logic, has been disastrous to the latest act. For when in their blind struggle for an escape, some countries have thrown off the obligations which had previously rendered impossible an autonomous rate of interest, these economists have taught that a restoration of the former shackles is a necessary first step to a general recovery. With floating exchange rates, there is no logic at all to protectionism since we have the means to increase investment funding by printing money and thereby lowering interest rates. Japan has done this for decades and it has saved their economic growth. At the height of the U.S. Information Revolution, in 1982-00, it was important to free-up and shift limited resources into emerging industries by offshoring production. However, since the new industries became much more productive – producing more output with fewer inputs – and the flow of resources have slowed into emerging industries, the timing may be appropriate to protect and reshore those higher paying jobs lost to offshoring, until the next massive economic revolution, similar to the prior Agricultural-Industrial-Information Revolutions. “We have got to stop sending jobs overseas. It’s pretty simple: If you’re paying $12, $13, $14 an hour for factory workers and you can move your factory South of the border, pay a dollar an hour for labor,…have no health care—that’s the most expensive single element in making a car— have no environmental controls, no pollution controls and no retirement, and you don’t care about anything but making money, there will be a giant sucking sound going south. Is China successfully managing a smooth transition, or rebalancing, or is it postponing the inevitable, making it worse? Either way, the big losers will be China’s masses, who still earn very little, from the very low starting point, and with very limited benefits or a safety net (e.g. compared to the Japanese). Half of China has been uninhabitable across human history. The Taklamakan desert is big, no rainfall, no vegetation – take the train from Urumqi towards Hami, hours of nothing. Now the Ming (re)settled people along the Ming Great Wall as part of their defense strategy, in areas that had been pastoral. Desertification resulted, in areas that were best left untilled. But these areas aren’t (yet?!) uninhabited. Oh, and then there are mountains, and the 16,000-foot-high Tibetan plateau. Look at a topographic map!